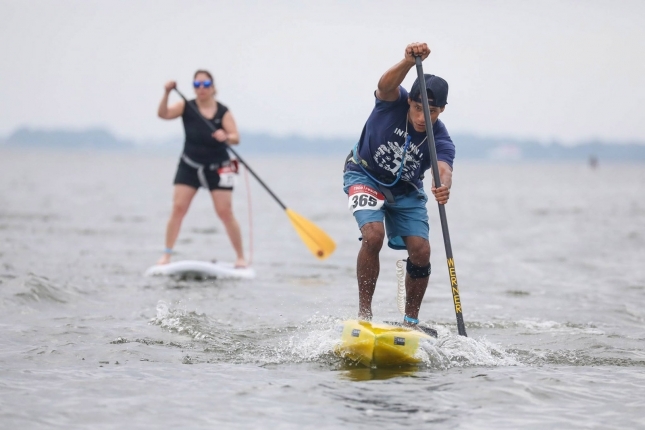 In brief: Dark horse Eri Tenorio claimed his first career title with victory at Maryland’s massive Bay Bridge Paddle on the weekend. The Brazilian-turned-Florida-local outclassed Paddle Monster coaching guru and ageless robot Larry Cain to claim the 3-star Paddle League Regional, while Annapolis local Fielding Pagel, known as something of a local dark horse himself, took third spot on the podium. 16-year-old Jack Ballard was fourth to continue his promising from following victory at the 1-star Pirate Paddle last month. In the women’s nine-miler, East Coast #1 Seychelle was too strong for the assembled field, paddling clear of Kim Barnes and Stephanie Shideler to win by three and a half minutes and put in some solid preparation for her assault on Europe. However the real story of the day was just how many paddlers hit the water, with over 400 paddlers across all divisions and distances. That number puts the Bay Bridge in rarefied territory and continues the movement of the mass-participation, grassroots events that provide the genuine fuel for our sport’s fire. Full recap and video incoming; in the meantime, here are the full results.